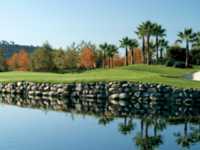 When looking for great San Clemente tee times, Talega Golf Club is a Fred Couples and Brian Curley designed, 18 hole, par 72 course, which from the back tees measures out to 6,951 yards, and has a slope rating of 136. The course design is unique with its five par 3s, and par 5s, and in that the back nine, which has a par of 37, plays nearly 500 yards longer than the front nine, and includes one par 5, the 13th hole that plays 624 yards. Talega Golf Club discounts can be found, which make playing this challenging, yet enjoyable course fun for golfers of all levels. Talega Golf Club has a full complement of amenities as well, such as the golf shop, which carries a full line of golfing apparel and accessories, in addition to an expanded clothing line of more casual, laid back, beach culture options. The restaurant is open seven days a week for breakfast and lunch, and has a complete line of beverages available at the bar. Their banquet facilities are capable of accommodating up to 200 guests in their 2600 sq. ft. banquet room with a large courtyard and terrace patio. Many past visitors have enjoyed their San Clemente golf deals at Talega Golf Club, and have commented how they had done a nice job of balancing difficulty with playability.